There’s nothing quite like a good night’s sleep. At Morgan, the concept is unfamiliar to many on school nights; students and teachers alike don’t get enough sleep. Such insufficient sleep can have negative effects on the teachers and students, especially in school. Sleep offers a variety of benefits, according to a resource from the Division of Sleep Medicine at Harvard Medical School that describes the benefits of sleep. Getting the recommended 8-10 hours nightly can make a person more energized and improve memory, learning, metabolism, and the immune system. It can also improve mood. Interestingly, not only does sleep help the conscious ability to memorize and learn, but it also helps the unconscious ability to process and retain information. Overall, sleep is vital to performance in school. Lack of sufficient sleep has many detriments. Losing sleep for only one night is not nearly as consequential as a consistent lack of sleep over an entire school year. According to a resource from the Division of Sleep Medicine at Harvard Medical School which describes the detriments of not getting enough sleep, such a lack can have negative effects on cognitive function—in other words, one’s mental performance. A person’s ability to focus is impaired, and there are negative effects upon concentration, logical reasoning, memory, and learning. One of the most obvious effects of sleep-deprivation is sleepiness. 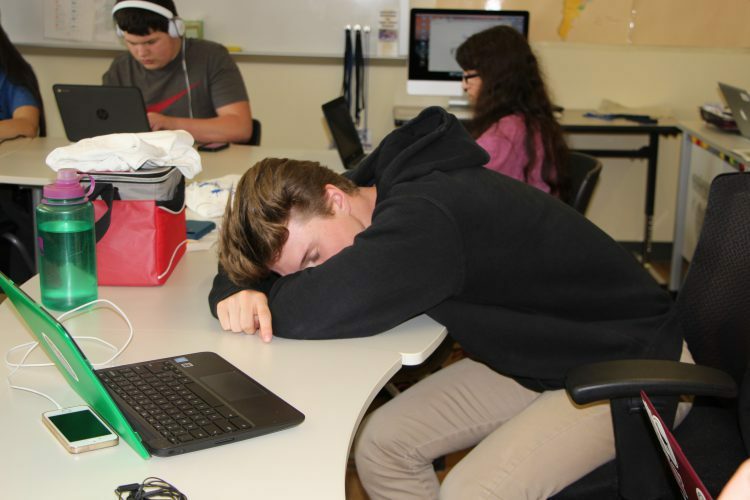 Sophomore Calvin Jackson claimed, “I’ve seen plenty of people doze off or fall asleep in class.” Obviously, sleeping in class is not only detrimental to the student who is sleeping and missing out on information, but it could also be distracting to others around them. After sending surveys to the students and staff, data was gathered on their sleep-deprivation. The majority of students at Morgan get about 6 hours of sleep on a school night. Out of 169 students surveyed, only about 19% of them get the recommended 8-10 hours of sleep nightly. 77% of students claim that they lack sleep because of an overwhelming interference: homework. Out of 121 students surveyed, 63.6% of them work on their homework at night, and 32.2% of students claim to do the majority of it at night. This can be a problem as most students claim to get 2-3 hours of homework daily, which, if worked on at night, will cut into their sleep time. 52.9% of students take 3 or more honors classes, which tends to increase the homework load. Students also credit sports and use of social media as reasons why they don’t get enough sleep. About 47% of students surveyed say they lose sleep from sports, and 49% say they lose sleep from using social media. Students aren’t the only ones who don’t get enough sleep. Most faculty members get 7 hours of sleep nightly. They might not have homework keeping them up, but they’re burdened with interferences such as their kids, stress, lesson planning, grading papers, and the freedom that adults have of making their own bedtime (and, consequently, a late bedtime). A majority of the faculty believe students get 5-7 hours of sleep on a regular school night. Their assumptions hold true, yet beg the question: Why do teachers think students are losing sleep? Without a doubt, the teachers’ most common guesses are true. With all these interferences and late bedtimes, there’s no wonder why so many students are sleep-deprived. However, with good time management, good decisions, and a reasonable bedtime, any student or teacher can get a good night’s rest.